One of my favorite trends right now is colored jeans!!! If you’re looking for a way to incorporate more color into your wardrobe, colored jeans are a great way to do it. Jeans are versatile, can be mixed and matched with different tops, and can be dressed up or down. I fell in love with these jeans (also available in sun and mint!!!) and this jacket, both by Sam Edelman, when I saw them at Nordstrom last week. Both the jeans and the jacket have a frayed hem which I’m loving lately!!! 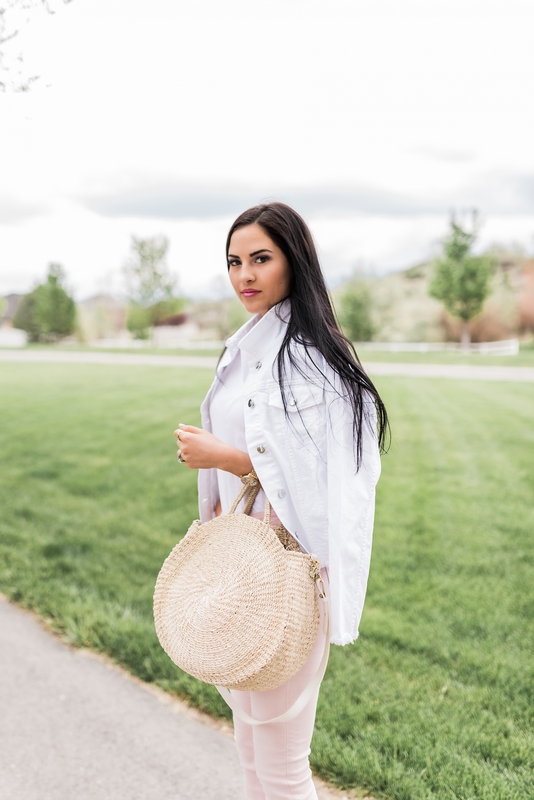 When I find the perfect pair of jeans I tend to wear them on major repeat, and I definitely plan to wear these all summer and spring long! How do you guys feel about colored jeans?! Brought to you by Sam Edelman. Very delicate and elegant outfit with these soft colors! The pink jeans are so cute! I’ve been into the colored jeans lately as well! Im sl glad colored jeans are back. I loved wearing them a few seasons ago. Those green ones you linked are exactly the color kve been looking for! Thanks! these pink jeans look so good on you! The cutest pastel pink jeans look … casually beautiful! ????? This is such a cute fresh summery look! I love colored denim too!! Love this on you1! Love this outfit, it’s so bright and perfect for spring! love this look so much. perfect for spring! So love the pink pants and your clutch! Those kind of light, pastel and neutral colours suit you the best! You’re looking great here! Love the pink and white combination! Super cute look! I love colored pants. This pink shade is to die for!??? I love colored denim! 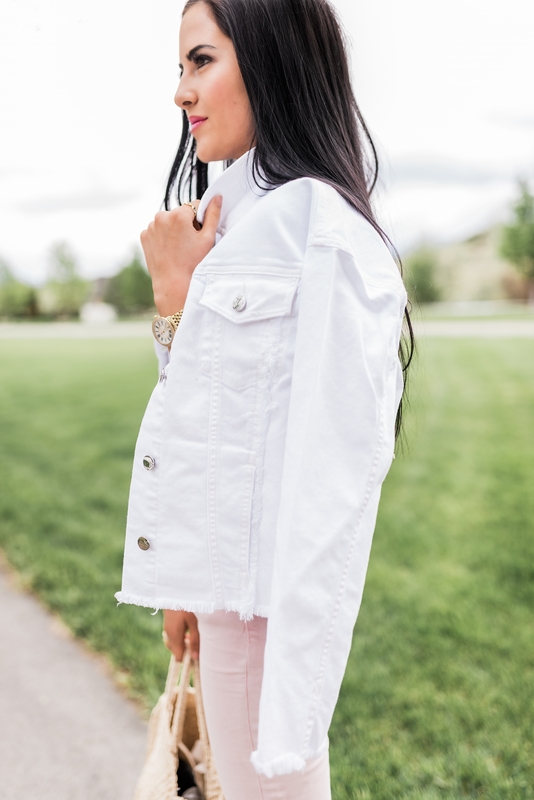 These pink jeans look great with the white top and jacket! It’s such a feminine combination. I love those pants! They’re perfection!